For Christmas, I received How Soccer Explains the World: An Unlikely Theory of Globalization by Franklin Foer. I had not heard of the book (though it was first published in 2004), but as a soccer fan, I was excited to read it. Very quickly into the book, I could see that Foer is an engaging author. Much of his research was done through interviews, and he recounts his interactions with colorful folks from around the globe. As a fan of the Beautiful Game who possesses less-than-brilliant soccer talent and is unfortunate to have been born in a culture ignorant of the virtues of the sport, I felt a sort of camaraderie with Foer while reading his book. His writing on the history and culture of soccer in different parts of the world was well worth the price of admission. What makes this book even more interesting is how Foer makes connections between the culture of soccer in a country or region and the political and economic landscape of that region. 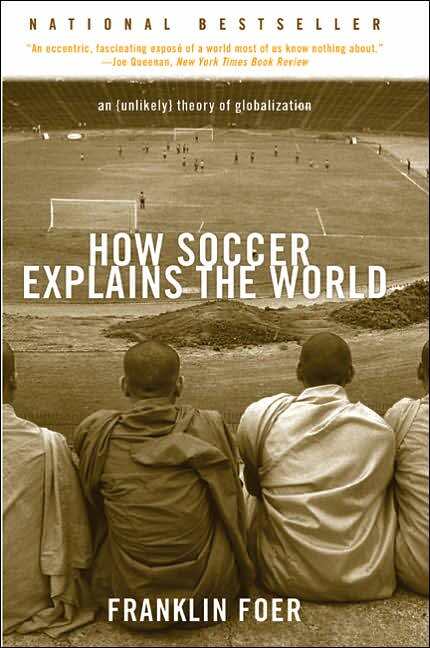 As the title promises, he weaves a few thoughts of globalization and how it relates to soccer throughout the book. Foer’s work is a much easier read than the title suggests. To be sure, each chapter required that I brush up on my knowledge of world history, but it was an enjoyable and quick read. Definitely a good fit for any fan of the game.